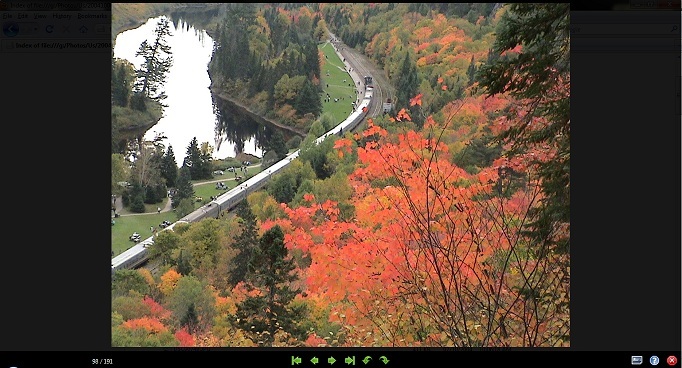 You can easily view images of a page with Full Window Image Viewer extension. After the installation, you can click on the extension's icon to turn on the Image Viewer. 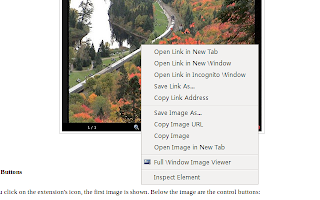 You can also right click on an image and select the Full Window Image Viewer item from the context menu. At the bottom left corner, the index of the current image and the total number of images are shown as current/total. If you click on it, you can input an index of the image you want to jump to. Toggle to see the image between its original size and full screen if it is bigger than the screen. Jump to the first image. Jump to the last image. To the left of the control buttons is the information shows the current image number of the total image number. There could be many small icons on a web page. You usually don't want to view them in Image Viewer. If Image Viewer detects the image is small than the size you want to filter, it will not include the image in its showing list. The showing size is 100px for both width and height. If the size of the image is unknown -- e.g. the image has not been loaded in the web page yet, or it is an image link -- the image will be included into the showing list. After it is loaded, its size is known and will not be included the next time if its size is too small. Home : Jump to the first image. Left Arrow : Show the previous image. Right Arrow : Show the next image. End : Jump to the last image. Down Arrow : Rotate the image -90°. Up Arrow : Rotate the image 90°. Space bar : Start/stop slideshow. ESC : Close/Exit Image Viewer.